When you’re a smoothie person, winter can seem pretty bleak. The refreshing, light and cool smoothies of summer are singularly unappealing — not to mention out of season — when the trees are all bare. But be brave, and don’t pack away your blender just yet! Instead, try some new strategies for smoothies that’ll warm your bones. Spices don’t just add flavor. Adding ginger to a fruit smoothie (or just about any green smoothie) gives it a serious kick and some health benefit too. Spices like cardamom, anise and cayenne warm the stomach. For banana smoothies, use Caffe D’Vita Chai Tea Latte for major deliciousness. Also try goji berries, black pepper, cloves and nutmeg. No ice allowed in winter smoothies but try adding plain Greek yogurt, which is an excellent source of protein, and add your own sweeteners as desired. Like Greek yogurt, nuts add protein and fat, which your body needs to keep warm. They also add dimension and richness to the flavor of your smoothies. Try pistachios or walnuts with apples. Coconut (flakes) goes with just about everything. And whatever you do, don’t forget about peanut butter! 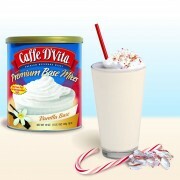 When all else fails, just take one of your summer Caffe D’Vita smoothie recipes and warm it up! Try blending mango, banana and juice to a consistency you like, then warming it on a saucepan briefly. Alternatively, cook 1/4 cup of oats in milk, then blend with berries and yogurt. Drink it while it’s still hot. If you are interested in becoming a Caffe D’Vita foodservice distributor, we would be happy to provide you with the resources to market Caffe D’Vita products to your customers. To contact us, simply click here or call us at 800-200-5005 x315. Caffe D’Vita’s premium foodservice products will exceed your quality and taste standards as our Cappuccino products have for over 40 years.